Today is Valentine’s Day +1. But it’s not too late to make your valentine smile. It’s a simple equation: good quality chocolate + heavy cream (+ optional flavorings) = heavenly chocolate truffles. Yum. It’s true, a lot of chocolate and candy making is tricky. I’m quite happy to leave the tough stuff to the pros at Beta 5, Chocolate Arts, Thomas Haas and others around town. Those are some impressive chocolates. Chocolate truffles are impressive too. Intense bursts of chocolatey goodness. And they’re surprisingly easy (and fast) to make, even if your skills and equipment are limited in the kitchen. These are classic chocolate ganache truffles — just simply quality chocolate and heavy cream. If those two ingredients (and a little cocoa for dusting) are all you have, that’s enough. Dark ‘n Stormy: A tribute to our favorite summer beverage. These are all bittersweet chocolate, with a few tablespoons of dark rum and tiny bits of crystallized ginger. I finished these with a light dusting of cocoa and a pressed a tiny piece of crystallized ginger into the top of each one. Cardamom Chip: My favorite spice, infused in the cream, in a mixture of milk and bittersweet chocolate. I finished these with Belgian chocolate flakes (a lovely find from Gourmet Warehouse). I’m using all my willpower to not gobble them all up in one sitting. Use a good quality chocolate (like Valrhona or Callebaut) — no cheap chocolate chips! And be sure to chop your chocolate into tiny pieces so the hot cream can melt it easily. Add liquid flavorings (liqueurs, flavor extracts) or crunchy bits (toffee, crystallized ginger) after the chocolate is entirely melted. Cool the ganache to a temperature that’s cool enough to shape the truffles yet warm enough to let your finishing layer stick. One reason I like chocolate truffles is because they’re meant to be a little rustic, a bit imperfect and sometimes rough around the edges. Kind of like love that lasts for years. Happy (belated) Valentine’s Day. Easy peasy chocolate making that needs no special equipment or skills. 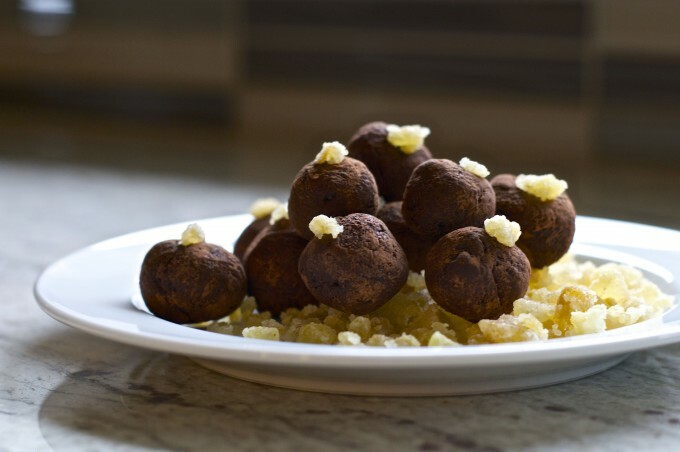 Two flavors of truffles -- Dark 'n Stormy (rum and crystallized ginger) and Cardamom Chip -- will bring intense, chocolatey bites for you and your valentine. Or just you, because they're so tasty. 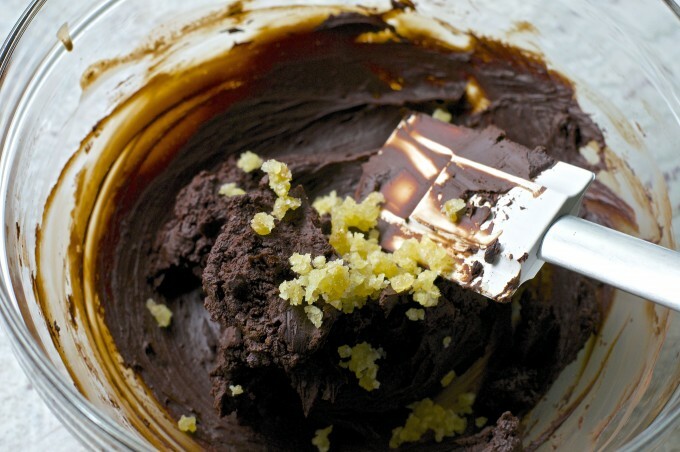 Finely chop the chocolate and place in a medium sized bowl. Make a small well in the center of the chocolate. In a small saucepan, heat the whipping cream to the boiling point. Immediately remove from heat and pour over into the center of the chocolate. Wait a minute or two to let the cream melt the chocolate, then gently stir with a spatula until all the chocolate has melted. Stir in the rum and let the mixture cool until it's hardened enough to shape. Stir in the crystallized ginger. 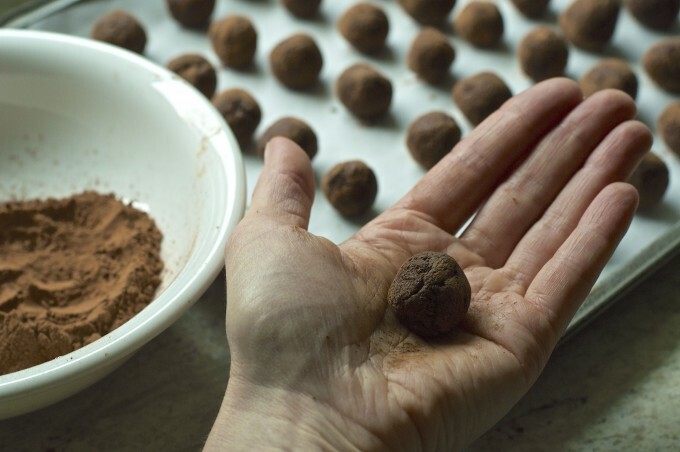 Scoop a small teaspoon of the truffle mixture and shape into a ball with your palms. Place on a parchment lined baking sheet. For finishing: Sift the cocoa powder into a small bowl. Dust some cocoa onto one of your palms, then roll each truffle between your palms, adding a small amount of cocoa as needed for a light coating. Place on your parchment lined baking sheet. Take a small piece of crystallized ginger and gently press into the top of each truffle. 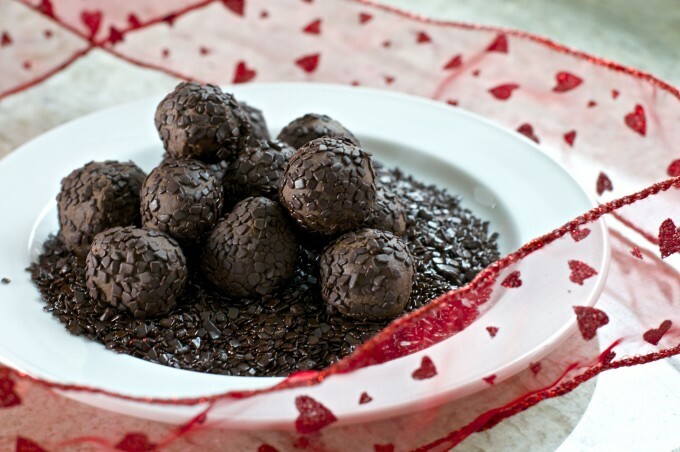 Refrigerate truffles to harden. For serving, take them out of the fridge about 30 minutes to soften. In a small saucepan, add the cardamom to the whipping cream and heat to the boiling point. Immediately remove from heat. Let cool, then cover and place in the fridge for 4 hours or overnight to let the cardamom infuse its spicy goodness into the cream. Heat the cardamom-infused cream to the boiling point. Immediately remove from heat and pour over into the center of the chocolate. Let the mixture cool until it's hardened enough to shape. For finishing: Place chocolate flakes into a small bowl. Roll each truffle in the flakes to coat. Place on your parchment lined baking sheet. Store these in the fridge for up to a week (if they last that long). For serving, take them out of the fridge for at least 30 minutes beforehand.